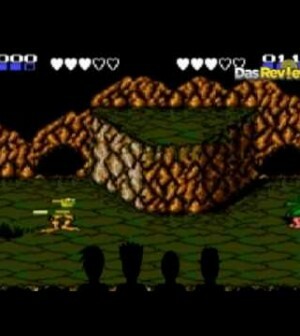 Home > Game Reviews > Old Skool’s Classic Gaming Theatre Presents: Battletoads for the Nintendo! Old Skool’s Classic Gaming Theatre Presents: Battletoads for the Nintendo! Ahhhh, the purple tinged skies of Ragnarok. The sweaty smell of roided up ‘toads. Yes, it’s Battletoads! In this episode of Old Skool’s Classic Gaming Theatre we sit down with Old Skool Fool, Doomraker and Front Seat Gamer and get our beat down on in Rare’s Battletoads. Grab your popcorn and wax the nostalgic goodness with them!